Yesterday was a pleasant day in Pittsburgh – partly cloudy and chilly, but fine weather. I had no reason to suspect any diffculties at the airport – except for the fact that there are ALWAYS difficuties at the airport. My parents dropped me off and I went to a Delta kiosk to check in – nothing. So, I asked a Delta employee to help me and when I mentioned JFK, she sighed and told me my flight was cancelled and I needed to wait in line to speak with a ticket agent. WHAT?!? Apparently, it was “weather-related”, which automatically gives the airline an out to take zero responsibility for my hassle. After the long back and forth with the rep at the ticket counter about my “options”… which were none…I took a seat on the 6am flight this morning. Of course, this morning, there was a delay…the “crew” had to “rest,” and so all of the tired travelers had to wait until they were ready to fly. People have work, school, and appointments to get to, so when the airlines and airports use the “weather” excuse, it gets very frustrating. We all know that JFK is too crowded and there are too many airplanes and too few runways, so unless every single detail went smoothly and perfectly, there is bound to be delays. When there is any weather at all – cancellations begin to happen. Can anything be done if your flight is canceled or your luggage lost? Yes – you can learn how to better navigate the system before hopping in the cab to the airport. 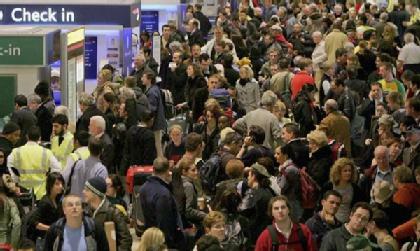 Here’s a crash course in surviving the chaos of airline travel. A 30-minute delay has stretched into hours. Time to look for another option. The odds: Since January, airlines have canceled more than 90,000 flights. And just 73% of arrivals in the past year have been on time. The plan: There are no federal regulations governing how airlines should help passengers affected by delayed flights, so you should take matters into your own hands. Dial the airline’s customer service number while you’re in line to change your ticket; you might find an open seat before you reach the counter. Another option is to head to the frequent-flier lounge. Even if you’re not a member, you can buy a one-day pass and make use of the less harried lounge staff to rebook your trip. 1. Get a wireless card for your laptop. If your trip gets messy, you won’t have to track down a Wi-Fi hotspot. 3. MobileCierge’s “mobile personal assistants” are available 24 hours a day and can secure last-minute reservations on all major airlines. The cost is just $8 a month. You packed it, they tagged it, but it didn’t show up on the other end of your trip. You can’t show up in the conference room tomorrow in the jeans you wore on the plane. Now what? The odds: From January to June, passengers filed more than 2.2 million lost baggage reports – up 30% from the same period in 2006. The plan: Chances are you won’t be the only angry person in line at the claim counter. Call the airline while you wait. You should still wait in line to fill out a claim form, and be sure to get a copy of it, along with an employee’s name and a phone number to follow up. The DOT’s Consumer Protection Division recommends negotiating a cash advance if you’re missing essential items that you need immediately. Most carriers authorize employees to give some money at the airport for emergency purchases. If your bags are lost for good, the airline will pay as much as $3,000 for your items, but you’ll have to prove their value. You would think that having a ticket means that you would be guaranteed a seat – not always the case. Too many people checked in for an overbooked flight, and we all know the airlines allow it to happen and then play some sick game with all of us at the gate. The odds: Smaller than you might expect, given that airlines routinely oversell flights to compensate for no-shows. From January to June, just a bit more than one passenger per 10,000 was bumped involuntarily. But the number did grow by 13 percent compared with last year’s figures. The plan: Negotiate on the spot. You have the right to ask for a full refund if you don’t want to accept the standard offer of a free trip in the future. You’re also entitled to as much as $400 if the airline can’t get you another flight or the substitute flight arrives more than two hours later than your original itinerary. If you have your laptop, find out when other carriers are flying to your destination; when you ask to have your ticket endorsed over to another airline, you’ll already know which flight you want. 2. Bumptracker.com takes it up a notch – detailing overbooked routes for each airline, the number of passengers bumped per flight, and the compensation offered. 3. Book on JetBlue – they do not overbook. At all. In the unlikely event that you are bumped involuntarily, JetBlue is very generous: they will give you $1,000 for your trouble. You’ve boarded the plane, seat belts are on, the plane has pulled away from the gate, and… nothing. Just waiting. The odds: In June alone, more than 2,000 flights kept passengers waiting on the tarmac for more than two hours. The plan: You don’t have a great number of options if you’re already stuck. In the wake of JetBlue’s pathetic response to the winter storm that shut down airports in the Northeast in February – and stranded hundreds of passengers in planes for as long as 11 hours – people have been discussing the issue, but not much has improved. If nothing works, you can do what Continental passengers did in July after waiting five hours in a hot plane: Organize a mutiny. They clapped and banged on the overhead bins until they frightened the pilot and he called the police. Just don’t be surprised if you’re stuck in a questioning room for a longer period of time afterwards. MM is in L.A. for work, so I decided to take a weekend trip home to Pittsburgh. One of my other sisters is coming home from D.C. and we are going to celebrate her son’s second birthday. I am told it is going to be a Diego themed party – Diego is the Spanish speaking friend of Dora the Explorer, which is a very popular children’s cartoon character who exposes little kids to the Spanish language. The party will only be our family, but two of my sisters who live in Pittsburgh have six children in total, so the party will be full. When I asked my sister what she was doing for the theme, she only had a pinata in mind. Being that I LOVE planning parties and making themes for everything, I was shocked. What about the menu? What about decor? What about music? My sister mentioned that she was worried the little kids wouldn’t be experimental with Mexican food, and she was thinking of having pizza…I had to find a compromise. So, in addition to a few normal pizzas for backup, I am going to make a MEXICAN DIEGO PIZZA! Hopefully, I can fool all of my nieces and nephews into eating it because I know once they try, they will love it. -Turn heat down to medium and cook pizza covered for 8 to 10 minutes or until cheese has melted and starts to bubble. -Serve hot garnished with sour cream, guacamole, and cilantro. INDOOR: Preheat oven to 450 degrees F. Combine and season beef and pepper strips as directed. Heat 2 tablespoons of oil in a large frying pan. When oil is hot, saute beef and pepper strips for 5 minutes. Remove from pan; set aside. Remove pizza crusts from package and top with salsa and cheese. Top with beef and peppers and bake in preheated oven for 8 to 10 minutes or until cheese is melted and begun to bubble. Garnish as directed. 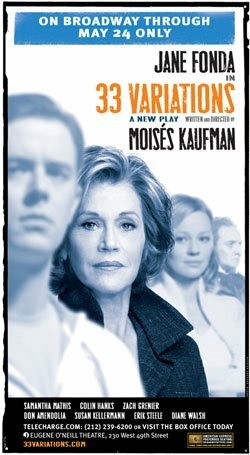 33 Variations – Jane Fonda is back…on Broadway! If you’re like me at all, you love Broadway but for some reason it seems unaccessible and too expensive. The prices at the movie theaters suddenly seem like chump change when you realize a show on Broadway or even OFF-Broadway typically go for $200 or more! When my mom was here, though, I wanted to try to offer her some show options in case she wanted to splurge with me. She and I used to go to shows when we would visit NYC when I was younger, so they have always been a special thing for us. In my research, I found the expected Wicked, Disney this – Disney that, etc, but I was pleasantly surprised and excited about a new offering on Broadway: 33 Variations with Jane Fonda and Colin Hanks. This show is a story about a mother coming to terms with her daughter, and a composer coming to terms with his genius. The 200 years that separates these two individuals, they share an obsession that might erase all time differences. Music, drama and memory bring you from present-day NYC to 19th-century Austria. The play is written and directed by Moises Kaufman who is also the authur of The Laramie Project and the director of I Am My Own Wife. The play stars 2 time Oscar winner Jane Fonda and gives Colin Hanks an opportunity to step out from his father’s film career. In the end, my mom and I had a very full schedule, so we weren’t able to make it to a show. But, next time she’s here, I think we will be happy to pay $200 each to enjoy 33 Variations, Jane Fonda, and another special mother-daughter experience. Tonight, MM and I are going to dinner at Craftsteak with our NYC family – the couple that has fast become our closest relationship as a couple. We’ll call them R&A for now. It is R’s birthday today, and we always spend our birthdays together, if possible. Craftsteak is likely to make all of us happy because we like meat and fish, and we like to think of ourselves as talented and experienced connoisseurs of NYC dining and we have yet to share a dinner table at Colicchio’s masterpiece in the Meatpacking District. Craftsteak is one of very few celebrity chef restaurants to originate in Las Vegas and then come to New York. Everything a Craftsteak is taking what exists at Craft and making it more glitzy and more loud – the dining room is four times larger and the ceiling is double the height than Craft’s. The bar is made of slate – and it looks more like a full-sized runway than a bar, which I better not share with some of my more adventurous girlfriends who much prefer to be ON the bar than at it. The wood tables are the same at both, only there are many more of them at Craftsteak. Everything works together to help in the consumption of big steak dinners. The menu is printed every day, and it follows suit with everything else in its gigantic size. There is also a raw bar , which is new for Colicchio’s concept. There are several obsessive categories of steak – corn-fed beef aged four different ways, Hawaiian grass-fed, several pricey gradations of Wagyu. Even the pedigrees and the provenances of the steaks are so specific that may even want to ask what the cow’s sexual orientation was – to get the most lean and healthy diet. Delicious sweetbreads, a roasted lobster tail (which must be roasted in liquid gold when you consider the price, fava beans with crushed hazelnuts, and even duck foie gras add to the menu variety in an attempt to hit you over the head with appeal. I’m excited for our dinner, but more excited about my company – hopefully we will be able to hear one another from across our enormous table in an enormous room over an enourmous steak. On Saturday, I did the unthinkable…I braved Bloomingdale’s with MM and my mom. It was our best option to find my mom’s outfit for our wedding and jewelry for my bridesmaids. We didn’t want to be wandering around the city trying to find something, and we figured Bloomingdale’s should have something that we would all like. Of course I had to go to the bathroom as soon as we walked in the door…nightmare. I hate public restrooms, and Bloomingdale’s wasn’t any exception. There was a line down a hallway, the stalls were dirty and smelly, and there were loud young girls being obnoxious in the line. I survived, but I would rather find a deli in the neighborhood or hold it next time. We continued up the escalators in an effort to find the designer formal wear for women – one, two, three, four…for crying out loud…it took four floors and a mezzanine before we found it. I have shopped in Bloomingdale’s plenty of times before, but I’m usually not looking for the high-end designer gowns – I tend to get stuck in the jean heaven they have on two. MM and I decided it was our duty to make her understand these factors and clear her head from the numbers on the price tag…there were a few more numbers than we’re used to. Then, the sales woman brought it all home for us…by spending the amount on the jacket, my mom would get a $1000 gift certificate good for anything on the entire floor! That’s huge. I am not a sucker for sales, but she needed to spend money anyhow, and to be able to get her bottom piece for nearly free made it a very good deal. MM used his fashion sense to go and find the perfect Marc Jacobs skirt in the same midnight blue that complimented the jacket and made my mom look like a supermodel – it was also within the $1000 range, which meant it was “free”. I also loved the fact that she was mixing designers, which always shows a good sense of style and talented shopping. After our exciting conquer of the 4th floor, we continued back down…four, three, two (don’t look at the jeans! ), one…where I also found the perfect pearl earrings and bracelets for all of my bridesmaids – and they were on sale, too.